On the evening of Saturday 25th June 2016 Dramnation presented a World Whisky Tour 2016 Session 2 at Pocket Bar in Darlinghurst Sydney. Being our first event held in the inner city of Sydney we wanted to ensure our experience was the same as what we have delivered out here at Crooked Tailor in Castle Hill. Getting in early we rejigged out setup to fit the new booths provided and found ourselves a perfect spot to stage the evenings tastings. As usual guests arrived to a welcome cocktail built with Old Forester Bourbon to create a tart Whisky Smash. Even with the cold evening air blowing in the bar filled quickly with guests and the cocktail was a delightful refreshing citrus twist to a perfect start. If being in a new location was not enough the locality also allowed for us to welcome 2 brand ambassadors into our session to assist in presenting and discussing their whiskies. Jeremy Daunay, creator of Le Baron Des Spirits and sole importer of Armorik Whisky from France, got the ball rolling for our World Whisky Tour. Later in the evening Matt Bailey from Scotch Malt Whisky Society presented a very special release of an independently bottled bourbon form the USA. Outside of these 2 whiskies we saw representation from Australia, Taiwan, India and Japan. Yet not to be outdone by cocktails and whisky we also delved into the association whisky has to beer with a tasting of a very limited release by Gage Roads Back Yard Brew. The crowd was swell with a very boisterous and jovial mood continuing throughout. It was excellent to see so many new and return faces as well as media attendance by Sydney Cocktail Club, Gourmantic, Whisky Ledger and Brown-Forman. To close off this world whisky experience the lads in the Pocket bar kitchen provided a delicious round of beef sliders. They went down a treat with guests remaking on how substantial and generous they were. Note that if you are a subscriber to our newsletter and attended this event there will be special discount codes provided for both Armorik and Scotch Malt Whisky Society if you care to make any online purchasing through these vendors. Also of interest is anyone who has attended a past Dramnation event is eligible to enter our Guest Pass Giveaway to Whisky Fair in August. Find out more here and be sure to enter. May thanks for Pocket Bar for accommodating our little jaunt around the whisky world and cheers to all who attended and look forward to seeing you all again soon. Nose: Fleshy green melon, pine needles, mint bubble gum, mild liquorice, a touch of smoke. Taste: Young, light & delicate. Fresh picked peppermint with a fruity melon ripeness complimented by elements of green tea. Finish: Considerably long with lightly spiced peppermint that grows into lemon zest & dry oaks. Other: Contains barley lightly peated under 10yo, medium peated around 12yo, some heavily peated older than 18yo + some sherry casks. Though the maturation process is much slower in Japan due to their cold winters, the country also suffers humid days in the summer giving. As The Hakushu is a vatting of several varied ages of malts form the one distillery this whisky does not carry an age statement. Nose: Warm apple fruits, a pinch of salt with toasted breakfast cereal notes. Pop tarts at a beach house! Taste: Light complex layering of oaks while displaying some sherry influence combined with a mineral rock element. Finish: Long & dry delivering a spice tickle on the tongue. Are you getting the feeling of biting on a lump of granite? Other: Armorik displays very mineralised elements throughout the core expressions linking this influence to the regions terroir. Nose: Fairy floss, dark berries, citrus zing with light wine-esque feel layered over coconut fibre mattresses. Taste: A waxy mouthfeel with competitive malts, fortified wine, lemon citrus, vanilla oaks and a handfull of caraway seeds. Other: Barley & yeast is 100% imported from Scotland. 10% to 12% evaporation per year during maturation suffering temps up to of 42ºC. Initially matured in American oak this whisky is finished in Ruby Port, Tawny Port & Vintage Port casks from Portugal. Taste: Warm overripe bananas, caramelised brown sugar and bacon fat and an effect of condensed milk sweetness, chewy texture. Finish: Dry alcohols, buttery and maple syrup textures. Other: David Vitale created Starward to be an accessible Australia whisky with a target price point affordable to the general public. Watch independent bottle shops and the Starward website for the Starward Projects releases recognisable by the white labels. The Projects series are all experimental in nature and often bottled at high proof ABV with big juicy chewy textures. Like many world whiskies region defines the period of maturation and age is not an important factor in judging this whisky. Region: Little Rock, Arkansas U.S.A. Nose: Rich vanillas with strong notes of hot cinnamon sugar donuts & grilled banana bread. Taste: Sweet distilled sugar & spicy fruits. Oaks are penetrating but only just, leaving splinters of cinnamon bark in the gums. Finish: Spirity & young as real prickle develops on the lips when finally the hidden bourbon vanilla maple syrup effect hits. Ahhhh there it is! Other: Founded in 2010 Rock Town uses grain from corn, wheat & rye that are grown within a 125 miles of the distillery. This whisky reacts well to water but in very small portions. 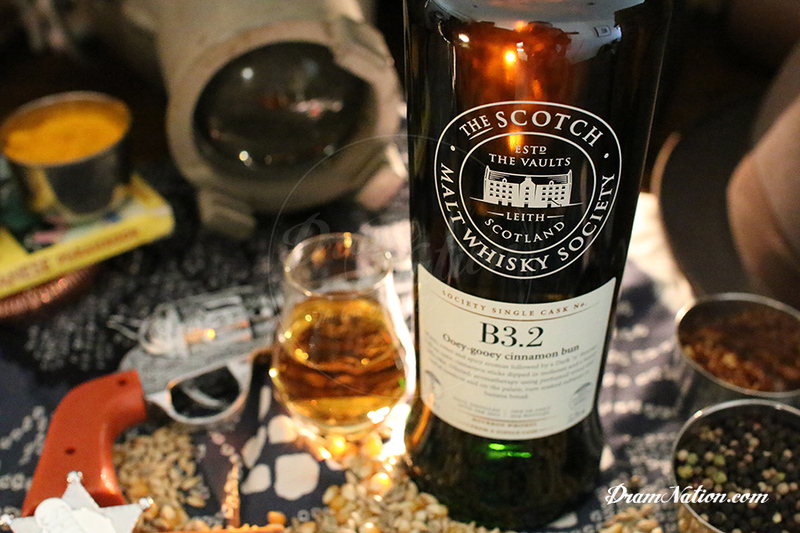 Scotch Malt Whisky Society (SMWS) is an independent bottler that only releases Cask Strength Single Cask Non-Chill Filtered Whisky often at no more than 250 bottles world wide. Nose: Fresh sliced ripe fleshy fruits, smoked peanuts, coconut, roasted coffee beans dusted with cocoa, salty canvas sports bag. Taste: Juicy & nutty with key embedded smoke elements, mint spice & an oily mouth coating. Finish: Long mint spice with bitter dark chocolate notes & a smoky breeze. Other: Paul John whiskies benefit from fresh sea air & equatorial maturation. Warehouses have been custom built partly underground to aid in slowing down the maturation process. The distillery looks to grow its barley in the cleanest environment possible with water being purified before irrigation occurs, while peat is imported from Scotland. Nose: Floral and herbal in nature with broad mint and vanilla characteristics. Taste: Light and woody with an inner mint rye spice. Finish: Oaky and long that slowly begins to dry out the mouth. Other: The Old Forester brand can claim to be America's first bottled bourbon dating back to the 1870's. Brewer: Gage Roads Brewing Co. Profile: Fruity, malty with light bitter hops and woody like honeys. The nose makes you second guess that it has been oaked but of course it has not. Crisp a rich with dark chocolate elements impacted by a red ale body. A complex malted brew displaying the versatility malted barley can have. Other: This beer is a special creation utilising a choice selection of malts: Biscuit Malt; Abbey Malt; Brown Malt; Cara Red Malt; Marris Otter Malt. Ingredients: 45ml Bourbon, 30ml fresh lemon juice, 10-15ml sugar syrup, 8-10 'clapped' mint leaves. Method: Add all ingredients to shaker with rock ice, shake hard and strain over crushed ice in an old fashioned/rocks glass. *garnish with lemon wedge, bushy mint sprig.